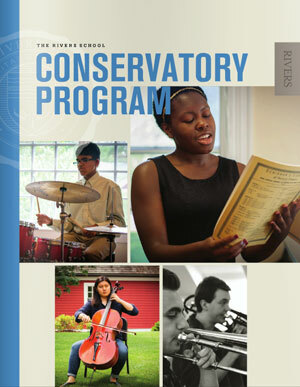 The Conservatory Program at The Rivers School is a unique and dynamic approach to college preparatory studies for students with a serious interest in and aptitude for music. This program provides student musicians with the faculty, classes, and performance opportunities needed to cultivate their musical artistry while at the same time pursuing a rigorous and challenging academic experience – all on one campus. Open to classical and jazz instrumentalists and vocalists in the Upper School (9-12) and runs in tandem with The Rivers School’s music curriculum. Conservatory Program students enroll in a stimulating and powerful academic program that includes 23 honors and 15 AP level courses in all academic departments. During the regular school day they join other student musicians in chamber orchestra, chamber ensembles, big band, jazz combos, women’s chorus, and men’s chorus. At the end of the regular school day, Conservatory Program students take additional classes in music theory, ear training, performance, improvisation, solfege, and independent studies, as well as being assigned to Conservatory Program jazz, chamber, or vocal ensembles. Applicants will be notified of admission decisions in March.